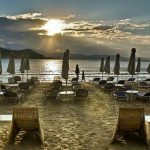 Naxos island is a big island in the heart of the Aegean Sea and its sea routes, with imposing mountain massifs and fertile valleys, inhabited by cheerful people with a tradition in music and dance, and full of beauty that enchants visitors. 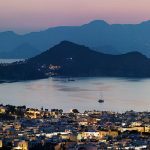 With its long history, important monuments and intense tourist life, it occupies a distinct place among the Cycladic islands. No matter how many days you stay on Naxos, there will always surely be more hidden niches to discover, beaches you haven’t seen, towers and forts you did not have time to visit, ancient temples whose secrets remain a mystery. If you were asked how you imagined the place where Zeus, the father of the 12 ancient Greek gods, was raised, chances are your reply would include the following: fertile, imposing, exuding primeval majesty. Dionysus, the god of merriment, was born and raised, you would probably include fun, song and dance. If, finally, you were asked how you imagined the scene of the wedding of Dionysus and princess Ariadne, you would probably respond, “Enchanting, almost magical…”. Deep in the mists of time, the beginnings of the history of Chora are intertwined with mythical beings, legends and heroes that are later succeeded by distinct eras: Mycenean, Roman, Byzantine and the periods of Venetian and Ottoman occupations. Its many monuments speak about a splendid past – the most characteristic one being Portara, the imposing propylon, or monumental gateway of the 6th century temple of Apollo on Palatia, the islet by the harbor. One glimpse of Chora’s past is given by the archaeological site of the Mycenean city of Grotta – large parts of which are submerged in the sea or lie under the built-up northern section of the town. Equally rich is Chora’s medieval history, amply indicated by its monuments and neighborhoods from Kastro to Bourgos. But the town also has a modern side, full of life throughout the year, with dozens of shops, restaurants, bars and cafes. It has all the services needed by the visitor and its shops supply all the local products, items of folk art (fabrics, baskets, ceramics) and jewelry, while its restaurants feature the broadly varied local cuisine. 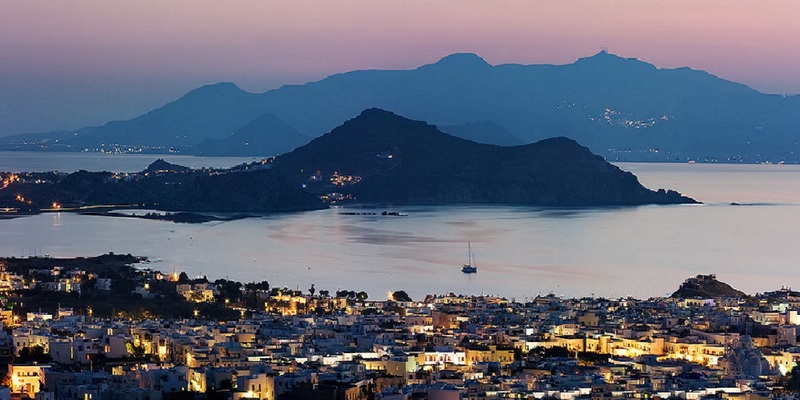 It is not surprising that Chora is one of the favorite towns for visitors in the Cyclades. 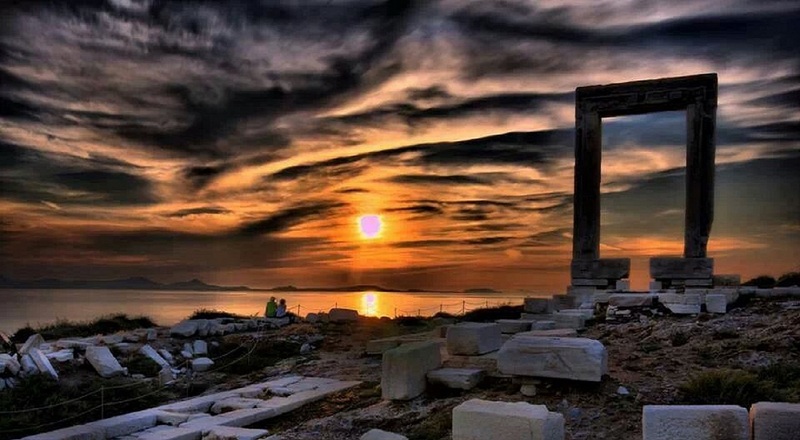 Naxos has never been deserted in the last 6000 years. The whole island is spotted with archeological sites: monuments that were dug up by archeologists have now become important and well organized archeological sites. 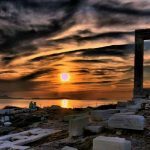 The most representative monument in Naxos is undoubtedly the Portara, this huge marble “Greek Pi” (Π), the door to the ancient Apollo’s Temple on the islet of Palatia, north of the port in Chora. The Portara, the Castro and the Church of Panagia Mirtidiotissa in the shallow waters of the port, are the true symbols of Hora and of the whole island. ARCHEOLOGICAL MUSEUM OF NAXOSThe Archeological Museum of Naxos presents the second largest collection of Cycladic objects after Athens Museum. MUSEUM IN SITO In the square opposite Paronaxia Cathedral (of Naxos and Paros) in Chora. IRIA’S TEMPLE It is a holy place, right in the middle of the Aegean area, that has never stopped being active from the fourteenth century till nowadays. Excelent example of Ionic monumental architectural style. KOUROS OF APOLLONAS It is an ancient statue of Apollo or Dionysus, of huge dimensions (about eleven meters), which has unfortunately left unfinished. KOUROS OF FLERIO AT MELANES This statue is also unfinished and, dating back to the fifth-sixth century b.C., is slightly “younger” than the Apollonas statue, as well as slightly shorter. KOUROS OF MELANES-POTAMIA (between Flerio and Potamia). ANCIENT AQUEDUCT FROM MELANES TO CHORA With its more than ten kilometers length, it was build during Ligdami’s tyranny. DEMETRA’S TEMPLE Situated close to the village of Sangri, Demetra’s Temple has been partially rebuilt and it is now considered of great interest as it is well preserved and it shows useful details concerning building techniques and the architecture of ancient temples. Next to the temple, a museum has been added, to contain all the remains that haven’t been used during the reconstruction, as well as those belonging to the Basilica that had been built, later on, on top of the temple. Both the museum and the archeological site have been assigned the Europa Nostra Prize for the sensitive way in which the excavation and the reconstruction have been conducted and the extremely low environmental impact of the museum building. HIMARRO TOWER next to Filoti, dates back to the fourth century b.C. and is located in the south-eastern part of the island, on the foothills of Mount Zas or Zeus. Built in local marble, it is skillfully carved and it is quite impressive because of its height, about 15 meters, and his cylindrical shape. Its dimensions, its shape and its architectural features makes it an important example of secular building, that was also used as observatory. Tower of Ipsilotera In the Galini area. This fortified monastery dates back to the end of the sixteenth-beginning of the seventeenth century. Vaseo Tower, Monastery of Timio Stavro Next to Sangri. This tower – monastery is situated not far from the road that links Hora to the Tragea, exactly where, at the crossing, you turn right to Aghiasso; it has been skillfully renovated and in summer, selected cultural events are held here. Monastery of Faneromeni, that is celebrated on August, 15th. Fortified Monastery of Fotodoti Next to Danakos. It is the oldest and probably the most significant in Naxos, in its category, thanks to its icons and inscriptions. It was donated by Marco Sanudo to the Benedectine Monks in 1227. Much later, it belonged to the monks of St.John Theologos of Patmos. Marcopoli – Kalavru Tower, at Kerami, in the Tragea plain. Belonia Tower At Galanado. It is one of the most ancient on the island, being built at the end of the fifteenth century; it once belonged to the Belogna family. 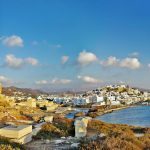 It absolutely dominates the area, giving the opportunity to check the sea north, west and south of Hora and the coast facing Paros. In the inside yard, St.John Church is to be found, with its two naves, one for the orthodox rite and the other for the catholic rite. Oskelo Tower, at Kastraki – Polihni, dating back to the seventeenth century. Barozzi – Paleologo Tower, at Sangri. Tower of Agia’ Close to Komiaki, set in a particularly flourishing environment, with abundant running water, lush wild vegetation, vineyards, vegetables and fruit trees. Once the Medieval Fortress of Agia’, it is strategically located at the north-eastern edge of the island. It was seriously damaged by fire in 1992, when its roof and the upper floors were destroyed. Crispi Tower, in Hora, also called “The Aperathitika Tower”. Frangopulo – Della Rocca Tower At Kouronohori, close to Melanes, it is one of the most ancient towers of the island, as it is mentioned in a document of the fourteenth century. Castle, royal estate and retreat of the Jesuits, it was built at the end of the seventeenth century. Della Rocca Tower At Sangri, it once belonged to the Barozzi family and to the Frangopulo family. Last but not least, there is quite a number of churches in Naxos! That’s why the Tragea plain, with its thousands chapels and churches, has gained the nickname “little Mistra”. Most of them date back to a period ranging from the seventh to the fifteenth century. Chief among them is the Panagia Drosiani, with its three layers of frescoes. 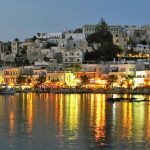 Naxos is considered one of the most beloved destinations in the Cyclades, both by Greeks and by foreigners. In summer, frequent ferryboats come from the main ports of Attika (Pireus and Rafina). 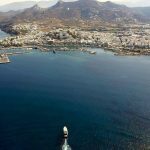 The island is also regularly linked to the other islands: Andros, Siros, Tinos, Mykonos, Paros, Ios, Santorini, Amorgos, Koufonissi, Iraklia, Skinoussa and so on. 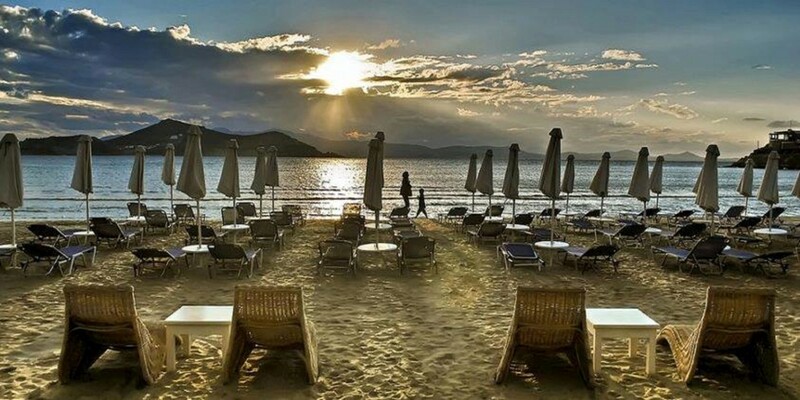 All main activities in Naxos are related to the sea, the air and the summer. The southern and south-western beaches are a hotspot for wind and kite surfing, classic sailing (rubber boats/catamarans), banana water rides, water skiing and diving. The endless sandy beaches and dirt roads that meander throughout the south-western plains offer fascinating horse-riding trails. But the island’s mountains and valleys with their network of traditional paths are also ideal for hiking all year round, and there are plenty of challenging dirt road tracks to explore by mountain bike. The sea has the right temperature for swimming or relaxing, but those who want something different can have fun on water slopes. There are many ways to explore an island rich in history, beauty and diverse landscapes. To get an overall picture or an introduction, you can choose a bus tour. Independent travellers can rely on a tourist guide and rent a means of transport. The tourist guides will offer you a deep knowledge of the island’s history, mythology and natural history. We sail from Naxos to explore the surrounding islands and islets There are daily excursions to the Cave of Rina, Kalando Bay, Koufonisia Islands, Delos and Rinia, Mykonos, Small Cyclades, Paros and Santorini. In Chora, there are many gyms that offer the possibility to exercise by the hour without being a member, as well as football fields (5×5) with synthetic grass.